Huanglongbing (HLB), also known as citrus greening, is a major disease of citrus that is currently devastating citrus production in Florida, Brazil, China and other locations where it is present. The bacteria associated with the disease are transmitted from tree to tree by a small insect called the Asian citrus psyllid (ACP). ACP was discovered on Hawaiʻi Island in 2003 and is now present statewide. Fortunately, the bacteria that cause the disease have not been found in Hawaiʻi. If the bacteria arrive, they would quickly spread from ACP feeding, and negatively impact Hawaiʻi's fragile citrus industry. 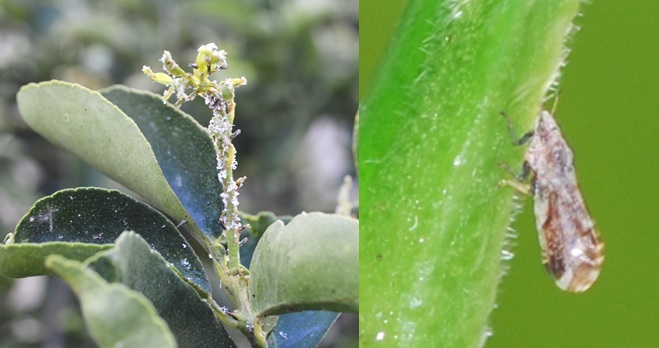 The symptoms of HLB are difficult to differentiate from other citrus disorders such as nutrient deficiencies. The only reliable way to test citrus trees or ACP for the disease is through a laboratory test. We are accredited through the USDA's National Plant Pest Laboratory Accreditation Program (NPPLAP) and employ certified diagnosticians to test citrus tissue and ACP from Hawaiʻi and the American Pacific for the bacteria associated with HLB. We also routinely travel to collect citrus plant tissue and Asian citrus psyllids from across Hawaiʻi to ensure Hawaiʻi is HLB-free. Please contact us if you would like us to collect tissue or ACP samples from your citrus trees and we will include you in this annual survey as well as waive the $25.00 diagnostic fee (for up to 10 samples). To submit samples on your own, please follow the instructions below. How to ship citrus tissue or psyllid samples for HLB testing. For citrus tissue, twigs from each tree should be placed in a separate sealable bag and labeled. 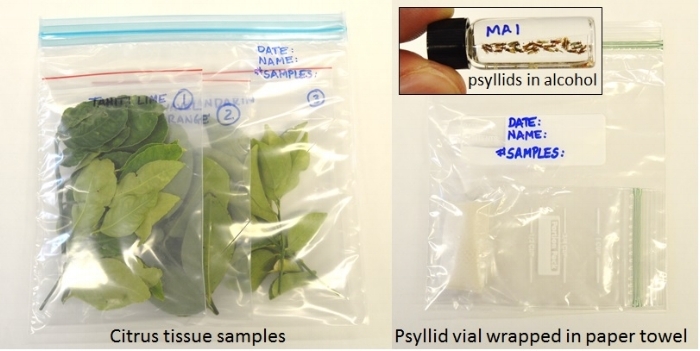 For psyllids, insects from different trees can be placed in the same vial.